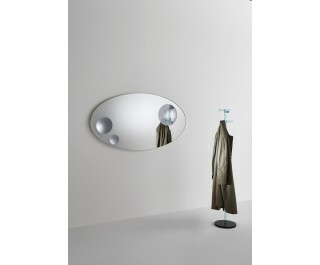 5mm extralight mirror available in round or oval shapes. The mirror assumes a magnetic aspect creating surreal effects thanks to three magnifying portholes fixed on a flat surface with each porthole having a different diameter and different degree of magnification. The mirror has a delicate bevelled edge on its perimeter under the silvered surface to refine and enhance the beauty of this object.